With modern techniques and equipment, having root canal treatment should feel no different to coming in for a regular filling. 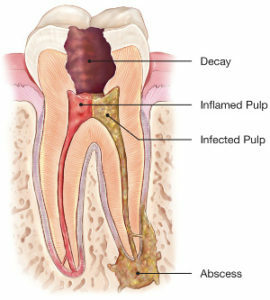 Root canal treatment is necessary when the pulp (nerve and blood supply) in the tooth becomes inflamed or infected. Symptoms of an infected pulp may include pain or severe sensitivity to hot and cold temperatures or pressure. The aim of root canal treatment is to remove infected pulp tissue from within the root canals, to allow relief of pain initially and elimination of infection with ultimate retention of the tooth. With a permanent restoration and proper maintenance, root canal treatment is highly successful. The infection can have a variety of causes: deep decay, repeated/extensive dental procedures on the tooth, a crack or chip in the tooth. In addition, trauma to a tooth may cause pulp damage even if the tooth has no visible chips or cracks. If pulp infection is left untreated, it can lead to an abscess and eventually the infection may spread to other structures of head and neck. If you are experiencing any of the above symptoms please phone us at Morgan Street Dental Centre for a consultation today.